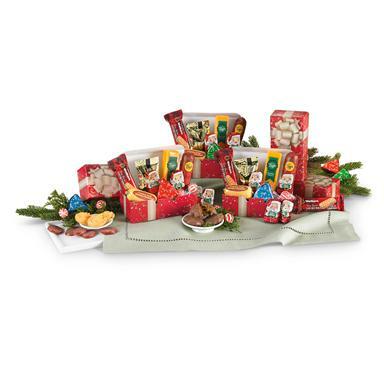 6 Ready-To-Go Gift Treats, SAVE BIG BUCKS! Bring festive holiday wishes to 6 folks on your Christmas list. Each Gift includes snack-sized smoked sausage and grade-A Wisconsin cheddar, a smoky cheese spread, Christmas chocolates, Walkers shortbread and more. For teachers, mail persons, paper deliverers... whenever you need an extra Gift, these are ready to go. In 6 bright red gift boxes, no wrapping required. Set weighs 2 lbs., 12 ozs. Note: sorry, no returns unless truly defective. Act ONLINE Now!